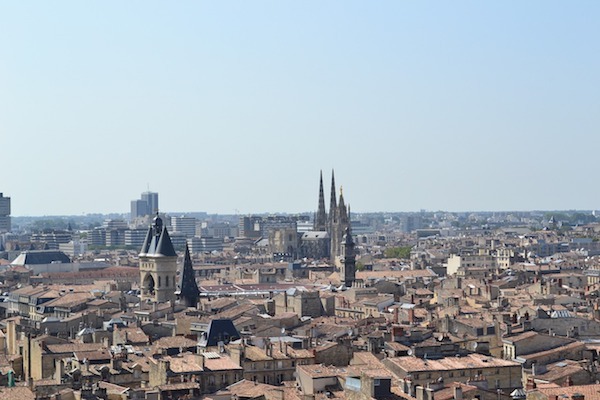 There are a number of ways to do a ‘sightseeing’ tour of central Bordeaux. This one captures many of the highlights, in a relatively straightforward 6k loop. The run starts at large Place de la Comédie, a large square where the Bordeaux National Opera and tourist office are located. The first 1.4 km is south along Rue Sainte-Catherine — the longest pedestrian street in Europe (best to go early…it gets crowded). At the end of Sainte-Catherine at Place de la Victoire, loop back north along Cours Pasteur, and passing by the Bordeaux Synagogue, the Musée d’Aquitaine (history museum), to the large square hosting City Hall, the grand Cathédrale Saint-André de Bordeaux, and the Museum of Fine Arts. Turn RIGHT on Cours d’Albret, and then bear right on Nancel Penard, to Place Gambetta, a nice park/square. Turn RIGHT on Cours de l’Intendance, another pedestrian mall, and then LEFT on R. Montesquieu, to the Place des Grands Hommes shopping center. Turn LEFT on Allées de Tourny, then RIGHT on Cours Verdun, making your way over to the Jardin Publique, a pleasant garden/park with ~ 1 km of paths. Exit the east end of park for the final part of the run — a loop around the Girondins Monument, with a fountain & towering column erected to honor Girondin revolutionaries. Use either the paths in the park or the side allées. Longer Run/Add-Ons. Lots of opportunities to add on river paths, or for more history & scenery, explore some of the streets east of Place de la Victoire. 6.7 km (4.2 mile) loop.